Location: PB #2	 50	 Missouri Angler Wed. Night Tourn. Location: Bledsoe Ferry	 20	 Average Joe’s Open Solo Bass Tourn. 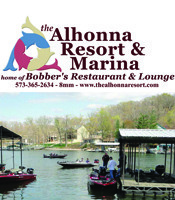 Location: LORA Marina	 40	 Lake of the Ozarks Rec Area Tourn. Location: Linn Creek Campground Ramp 35	 Camden County Bass’rs Club Tourn.